Custom nameplates can be fabricated from flexible or metal materials. Screen print, emboss, Metalphoto®, or etch text and graphics onto substrate surfaces. Nameplates can be made to withstand up to 25 years of outdoor exposure and may be die cut, digitally cut, laminated, or machined to your specifications. 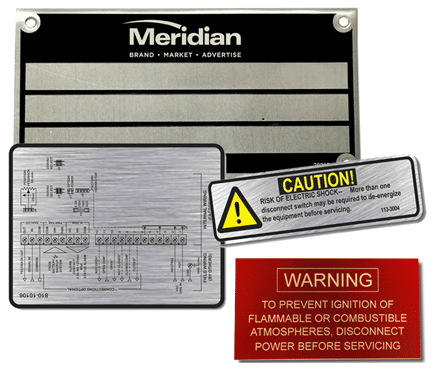 Premium nameplates are one of Meridian’s key areas of excellence. We use only the latest and most advanced techniques and technologies to produce the highest-quality products. Years of experience enables us to identify the ideal match of materials and imaging technique for each intended environment. We can also discuss alternatives and the costs involved so we can help our customers understand the cost versus benefit of the decisions they need to make.